The Thunderbird lived its last days as a two-seater sports car in 1957 which is when Ford introduced the 312 5.1-liter V-8 engine. 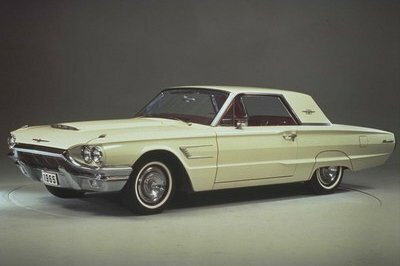 That’s how the E-Code Thunderbird was born, the beefiest of them all and the closest alternative to the Corvette that Ford ever offered. Ford debuted the Thunderbird at the Detroit Auto Show in February of 1954 and quickly dubbed it "personal car" so as to suggest it wasn’t a direct answer to GM’s Corvette. 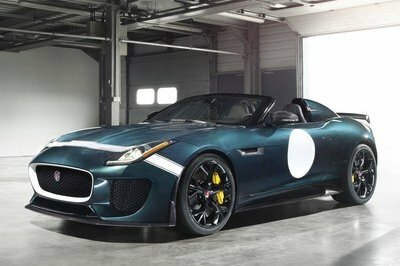 What it was, in all fairness, was a luxury sports car tailor-made for the kind of people that were looking for a more refined 2-seater model than the Corvette. 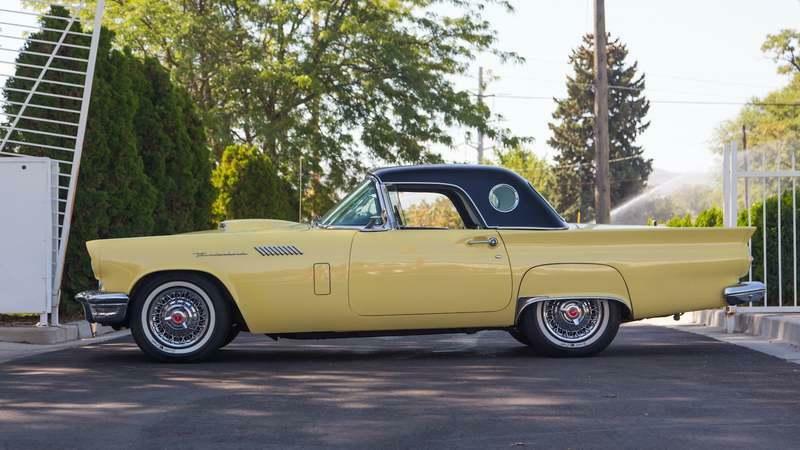 The 1957 Thunderbird was the last which retained the original two-passenger layout before Ford decided that their clientele would much rather go for a 4-seater sports car with added amenities and weight. So, for 1957, Ford made the most powerful T-Bird ever by introducing the 5.1-liter V-8 engine, in a number of guises. The twin quad-barrel carburetor ones were distinguishable by the letter E in the car’s VIN code - the source of the ’E-Bird’ nickname. Introduced in October 1956, the 1957 Thunderbird sported a restyled appearance front and rear and was longer 6.1 inches to accommodate the spare wheel which was back in the trunk. 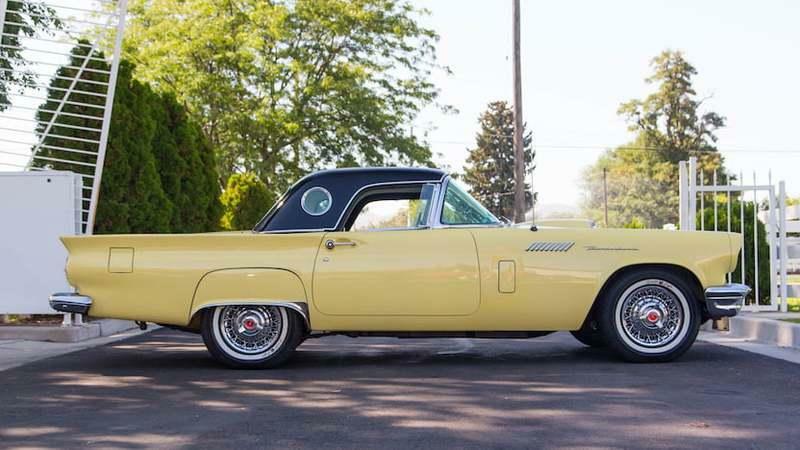 Ford looked to build on the Thunderbird’s strong popularity, which translated in 10 T-Birds being dispatched in 1956 for each Corvette, by giving it a fresh appearance and more power. Ford then withdrew from fighting the Corvette just as factory racing was also banned and went on to introduce a larger Thunderbird for 1958 to make ammends with the customers that were complaining of the tight interior confines and limited trunk capacity.
. Up front, the grille was enlarged which is why the front bumper was also reshaped. As such, the bumper now went down in the middle to not cover the T-Bird’s gaping mouth. That’s why the front fascia now had a more boxy appearance although the U-shaped bumper had rounded edges where it went down to accommodate the grille. On either side of the grille, rectangular indicators are incorporated in the bumper which goes around the short front overhang and ends in line with the front wheel well. The twin-headlights setup was retained for 1957, as were the metal eyebrows of the two headlamps. The round-edged hood features, as before, a delicate scoop finished which gathers air through a polished grille. From the side, it’s easy to pinpoint the simplicity of the T-Bird’s elegant line. Basically, the line of the front fender continues all the way to the back end, in spite of the elevated tailfins. Just above the front wheels, there’s the Thunderbird nameplate written in cursive letters. Aft of it are some angled louvers that are merely there to look good. The shape of the doors is slightly different on the ’57 T-Birds compared to the previous iterations. The car’s hardtop comes with the navy-like portholes integrated into the pillars. While these don’t aid the driver visibility-wise, the massive wraparound windscreen up front does, although customers still complained that, with the top down, visibility was limited either way. The car’s bodywork is painted in ’Sun Gold’ yellow which works with the black hardtop. New for 1957 were also the 14-inch wire hubcaps hugged by whitewall tires. The rear wheels were covered by stylish covers with added chromed side skirts. The rear fins begin extending outwards just above the door handles and but don’t gain too much in terms of height, nor did Ford add any chrome trim to them. That’s maybe because the rear area was already busier than ever thanks to the bigger round taillights and the reshaped bumper. Simply put, the rear bumper shares the design of the one up front only turned upside-down and with the middle bit filled in. What’s interesting is Ford’s choice to have the exhaust pipes exit via rectangular holes cut through the chromed bumpers themselves. 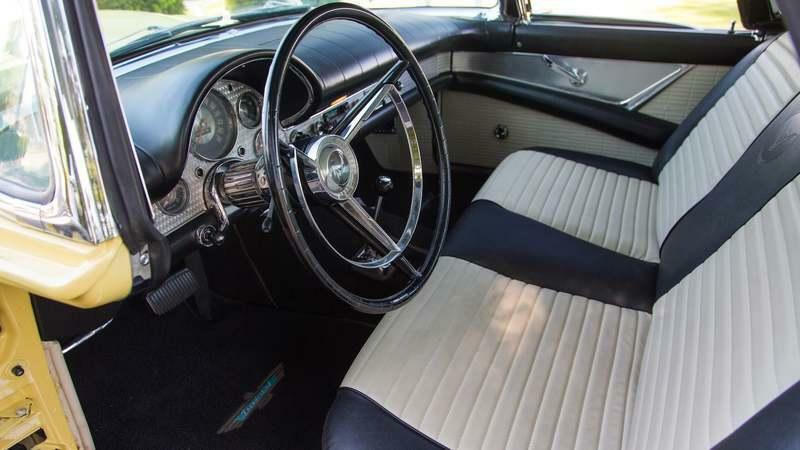 The interior of a 1957 Thunderbird is a style statement in and of itself. 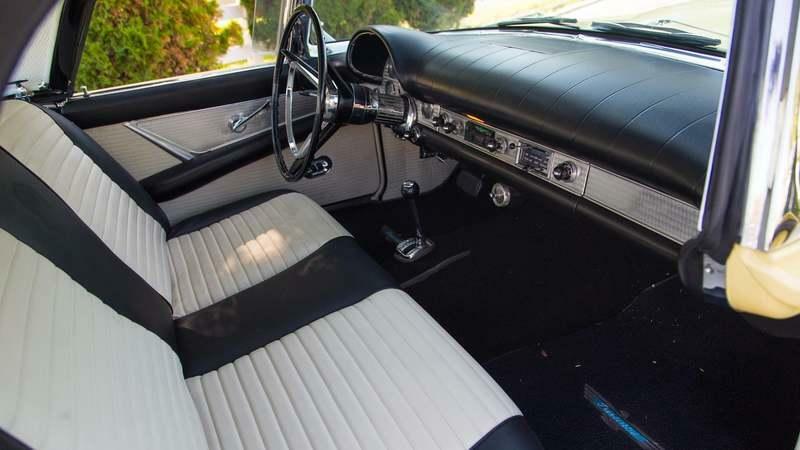 From the two-tone black/white upholstery to the padded dashboard and the metallic trim elements, it all looks upscale inside the T-Bird. The large-size steering wheel, as always coming with the smaller polished half-ring attached to the spokes, sits in front of the bubble that houses the enlarged gauges. The main one is the odometer, positioned proudly just above the steering column. There are two smaller round gauges on either side, all placed on the reflective metal center panel that extends down the whole length of the dash, as well as on the door panels. In the middle of the dash, there are the controls for the radio and, in some examples, the ventilation system. This particular example comes with an automatic transmission which is controlled via the tall shift knob coming out from the floor. This car also has power windows and power steering for improved driveability at small speeds through the congested downtown areas. According to Automotivemileposts, "there had been complaints about the passenger compartment being too warm, poor visibility with either of the tops installed, limited passenger capacity, and inadequate space in the luggage compartment." This is why Ford chose to repurpose the Thunderbird as a luxury 4-seat personal car for 1958, although the new car arrived later than planned since it was a brand new design sitting on a unibody platform. With that being said, when it did arrive, it proved to be a hit. 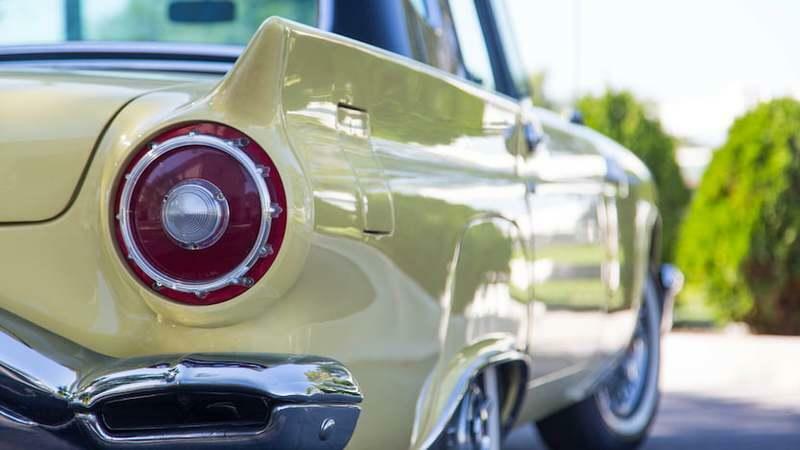 While over 21,000 T-Birds wre dispatched until December of 1957 when production ceased, almost 38,000 new, bigger, T-Birds were made in 1958 alone, confirming that Ford’s owners wanted the sporty feel of a T-Bird but with more interior and cargo space. There wouldn't be another 2-door, 2-seat, Thunderbird until the weird 2003 'retro-looking' Thunderbird that proved to be the model's final swansong up to this day. 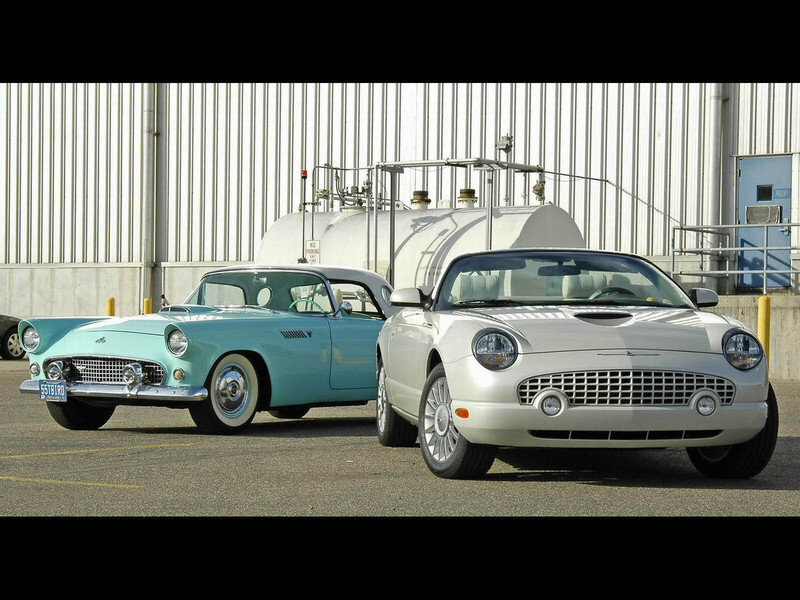 Only two V-8s were available with the 1957 Thunderbird. 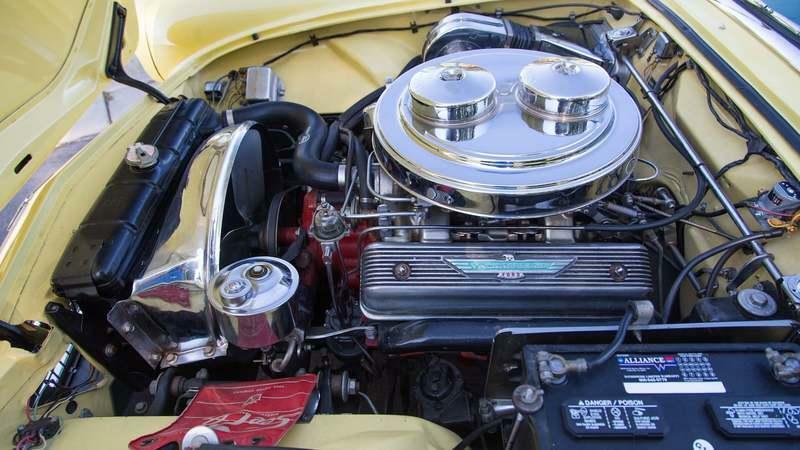 The basic engine was the 4.8-liter Y-block V-8 capable of 212 horsepower at 4,800 rpm and 297 pound-feet of torque at 2,700 rpm thanks to a 9.1:1 compression ratio. The engine was fed by a double-barrel Holley carburetor. 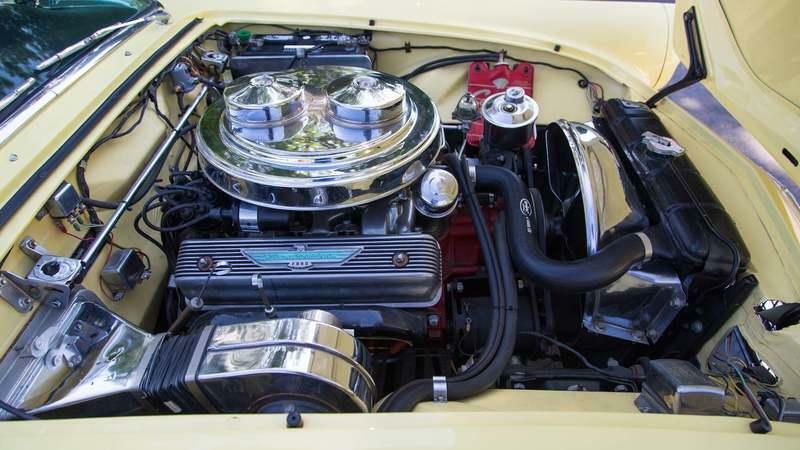 Further down the line, there were four versions of the 312 5.1-liter V-8 engine which was also part of the Y-block family but with enlarged bore and stroke. The basic 313 developed 247 horsepower at 4,500 rpm and 332 pound-feet of torque at 3,200 rpm. While the 292 V-8 could only be mated to the 3-speed manual, the 312 could be had with either the Overdrive transmission or the Ford-O-Matic torque converter transmission with planetary gears. The standard engine came on the ’Thunderbird V-8’ while the basic 312 came on the ’Thunderbird Special V-8’ which was distinguishable via the D at the beginning of the VIN number. Then there were the E-Birds. The first one, the ’Thunderberd Super V-8’ was powered by the same engine with the same compression ratio but, instead of one Holley quad-barrel carburetor feeding fuel in, there were two. That’s why performance jumped from 247 horsepower to 272 horsepower at 4,800 rpm and 336 pound-feet of torque at 3,400 rpm. 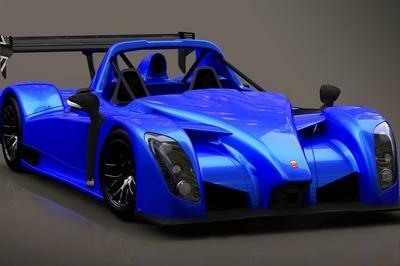 Then there was the ’Super V-8’ with the Racing Kit that increased the compression ratio to 10.0:1 from 9.7:1 which saw the power figure bounce up to 286 horsepower at 5,200 rpm and 343 pound-feet of torque at 3,500 rpm. Finally, there was the 312 V-8 fitted with a supercharger which was sold with the ’Thunderbird Special Supercharged V-8’ designation and had an F at the beginning of the VIN number. These special cars, of which only a few hundred were built, had over 300 horsepower under the hood and 340 pound-feet of torque thanks to the addition of the McCulloch supercharger to the single Holly quad-barrel carburetor. The most powerful Corvettes at the time, fitted with a high compression version of the 283 4.6-liter OHV V-8 could only put out about 283 horsepower. 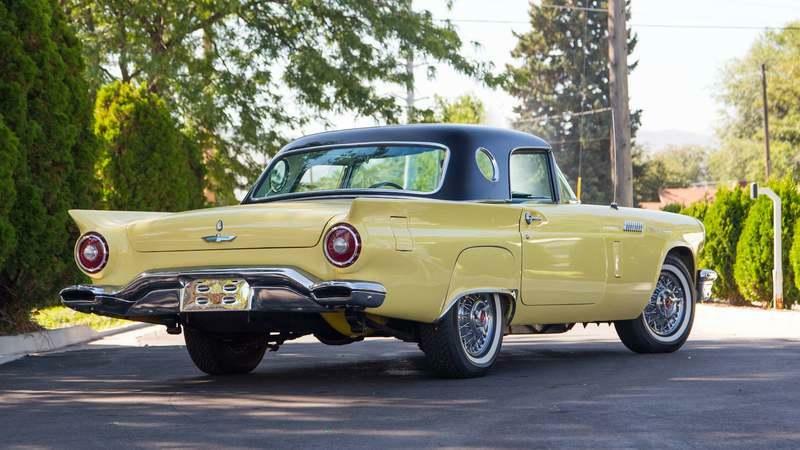 To counteract the effects of the added ponies, the 1957 Thunderbird had improved hydraulic drum brakes, revised spring rates, and the chassis crossmembers were stiffer than before. The suspension setup itself was pretty basic for the time. It was independent up front with unequal A-arms and coil springs while a live axle resided at the rear with semi-elliptic leaf springs connected to it. The 1957 Thunderbird isn’t a rare car in and of itself. After all, Ford sold 21,380 before finally introducing the 1958 T-Bird considered as the first model year of the second generation. But the E-Code models only account for about 1,500 of the total production figure, so that’s why we’re getting into the rarified air when talking about the E-Birds. 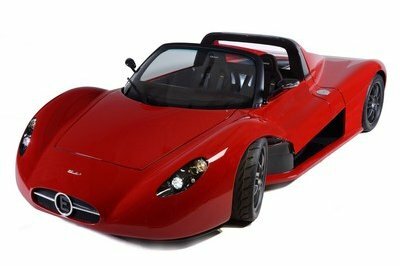 The car we see here, which comes with the least powerful of the double-quad 312 V-8 models, has a price estimate between $44,000 and $55,000. While that might not seem like much, supercharged models can sell for well over $60,000. Also, the prices will only go up in the coming years as these are collectibles that are gathering an ever-larger fan base as time goes on. The Corvette is the car that motivated Ford to build the Thunderbird. 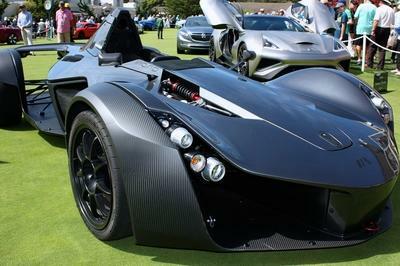 While not officially aimed at GM’s two-seater sports car, the Ford ’personal car’ which kicked off what would become the personal luxury car segment was clearly the sign that the gloves were off in the battle for supremacy in the two-seater sports car segment. In sales, the Thunderbird was the winner, outselling the Corvette by 10 to 1 in 1956 and still going up in sales by the time the two-seater first generation model met its maker. You can argue, then, that the T-Bird made the Corvette better as GM strived to make their sports car better than whatever FoMoCo had to offer. In the end, the Corvette is here today, and the T-Bird and that has something to do with the three-year rivalry between the two giants. 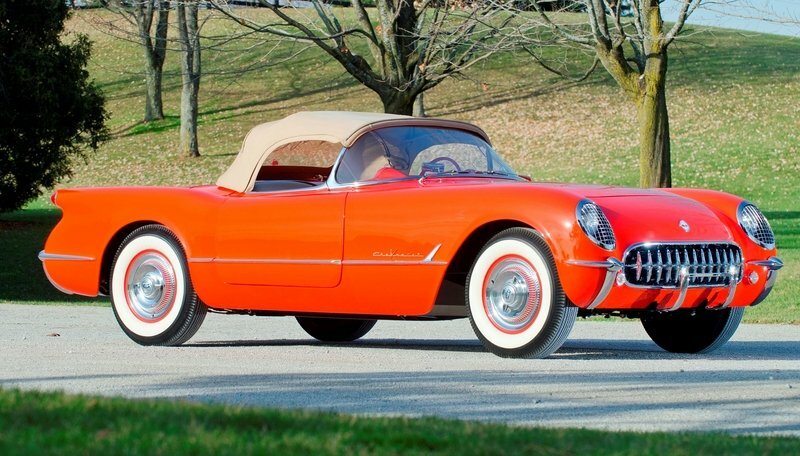 1957 was the second year of the revised C1 Corvette with its unmistakable ’coves’ down the side, the curved rear end and the vertical headlights. The Corvette looked posher and, although there were no inline-6 engine options left, the V-8s that were offered couldn’t outdo the supercharged T-Bird. Power ranged between 220 horsepower and 283 horsepower depending on the fuel feed system and the compression ratio. The 1957 Ford Thunderbird is the last of the breed, the swansong of the original sports car by Ford. It wouldn’t be until 1982 that Ford built a two-seater car and we’re better off if we never bring back memories of the EXP. It was a car that Americans bought in high numbers which made it America’s Sports Car before Corvette could even dream of owning that title. Sadly, the T-Bird bowed out of the sports car segment in 1958, and the ’Vette took over the mantle by default. One can only imagine how a T-Bird would’ve looked in the ’70s if Ford would’ve still pursued the idea to keep it relevant against the Corvette. Read our full review on the 1964 - 1966 Ford Thunderbird. Read our full review on the 2005 Ford Thunderbird.